Do you ever just crave vegetables? Maybe I am weird because I do, but sometimes all I want is to eat the rainbow. Whenever I am looking for an easy way to pull a dish together, I create a stir fry. All you need is one pan, your favorite ingredients, and about thirty minutes of your time. 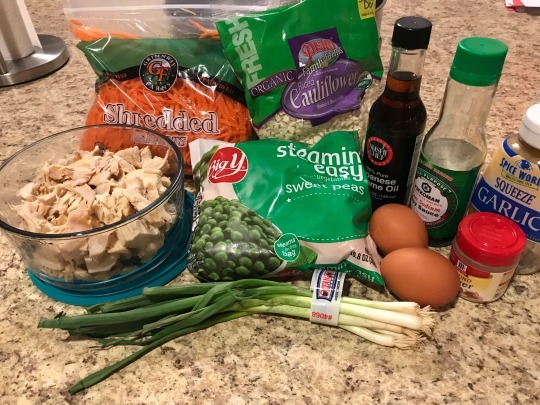 This stir fry includes plenty of veggies along with tri-colored quinoa and chicken breast for added protein. It is the perfect weekly meal prep or week night dinner. This week I had picked up some summer squash at the grocery store and decided to create some “squash noodles”. Although I don’t own a spiralizer, I found that it was just as easy and effective to use a peeler. The ribbons of squash cook quickly in a skillet and are incredibly easy to make. I paired the squash with sliced red, orange and green cherry tomatoes, broccoli florets, scallions and fresh cilantro. These ingredients represent the colors of the rainbow and bring loads of flavor to the stir fry. For added protein I included my favorite tri-colored quinoa from Lundberg Organic and some chicken breast. Tr-colored quinoa is a summer favorite of mine. I like to cook large quantities to keep in the refrigerator and add to salads or enjoy as sides to my dinners. 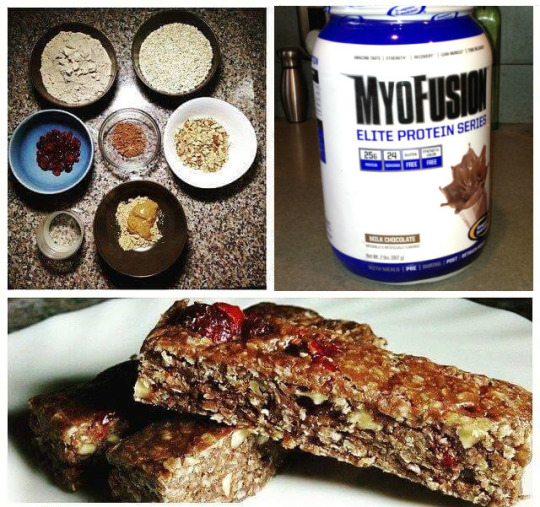 It is such an easy way to make any meal heartier and keep you feeling full and satisfied. Chicken is another protein I like to cook and bulk and add into my meals for protein. For this recipe I diced the chicken breast into cubes and sautéed them in olive oil with a bit of garlic. Print this recipe out to add into your cook book or save for later on Pinterest! Heat a medium sized skillet on medium heat and add 1 tbsp of olive oil. Let the pan sit for a minute before adding the diced garlic. Dice the chicken breast and add to the pan once the garlic becomes fragrant, stirring until the chicken is fully cooked. In a small sauce pan, heat 1 cup of tri-colored quinoa and 1.5 cups of water. Bring to a boil and reduce to a simmer. 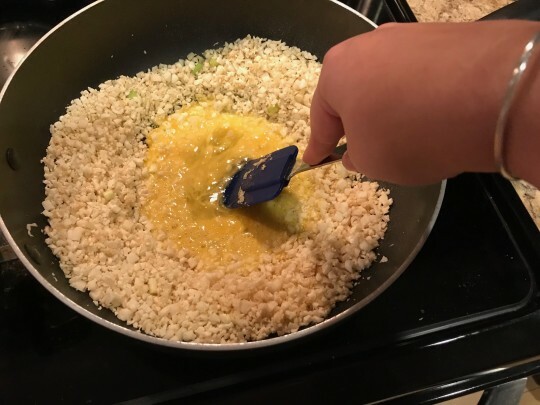 Cook the quinoa for 15-20 minutes or until it is fluffy and the water has been burned off. Once the chicken is cooked, remove from the pan and set aside. Add the other tablespoon of olive oil to the pan and let sit while you peel the summer squash. Once you get down to the seeds feel free to dice the remainder and add it into the stir fry. Heat the summer squash until it begins to wilt, then add in the broccoli, sliced tomatoes and scallions. Season with salt and pepper and add optional paprika. Once the broccoli and tomatoes are nice and bright, take the stir fry off of the heat and set the pan aside. Add in the soy sauce and mix evenly with the vegetables. Be mindful to not overcook the vegetables or the stir fry will get very mushy. Mix in the cooked quinoa and chicken, adding any additional seasoning until you find your desired taste. Top with fresh cilantro and enjoy! Do you ever just crave vegetables? Maybe I am weird because I do, but sometimes all I want is to eat the rainbow. Oh. Don’t get me started. My weight has plateaued at 145. The scale ain’t moving. And I was kind of ok with that because I realize that those last few pounds can seemingly take forever to lose. But something happened this week. I had a doctor’s appointment—it was time for me to have a well-visit, and I was told to get on the scale. With my clothing on no less! The scale in the doctor’s office had me weighing five pounds heavier at 150. What else could I do but turn to the nurse with a snarl and like an angry prizefighter I looked her in the eyes and said “Oh. And now after this surprise you’re gonna take my blood pressure?” “Just gimme the chart so I can write “high” for blood pressure”! She laughed at me. But it was no laughing matter. My blood pressure was higher! Hey Doctor! Your scale raised my blood pressure! My home scale still reads 145 as I write this and I chose to believe my home scale. There’s a reason for this. At the doctor’s office, just about every patient comes in and is weighted. All sizes of people—from lightweights to heavyweights and the scale isn’t adjusted after every use. Add to that, nobody is naked when they are getting weighed—how can the scale be accurate? And I find myself obsessing over my next appointment in three weeks. Hopefully, I’ll be a pound lighter—I’m not asking for miracles here. The good thing is that all my clothing still fits. After a bit of a weight gain over the holidays and throughout the winter, I lost a few pounds that makes a difference. My clothes look better and I feel better. And that’s all that counts. But more than that, those numbers aren’t making me try to hide my body at the beach! We headed to the shore yesterday and I gleefully wore a bikini. When the mercury hits upwards of 97 degrees Fahrenheit—I’m wearing what makes me comfortable. My “less-than-twenty-bucks” bikini from Amazon! My new favorite mall! I’m doing the same today, except after writing and working on a YouTube video, I’ll head outside on our deck with a good book, water and my bikini! We can’t allow ourselves to feel as though we’re not supposed to wear certain swimwear after the age of 50, 60, or older. Oh yeah, baby! I’m wearing a bikini as I write this because it is hot as h-e-double-hockey sticks out there! And guess what? You don’t need a perfect body either! My pouch from carrying three babies is still there because I’ve never hit the gym after birthing my children. My thighs are soft because I’m too anxiety-ridden to walk the suburban streets and running makes me miserable. If I had a motor strapped to my body, I could, possibly spread my arms eagle-style and use the flab as airplane wings and fly across the Atlantic rather than spend money on an airline ticket. That’s right. I’ve got the soft belly and thighs and it doesn’t matter. No woman should be made to feel she can’t wear a bikini because she doesn’t have the perfect model’s body. Let’s be realistic. It’s HOT in the summer. All women deserve to be comfortable! Despite the scale, I’m A-OK with my body in swimwear. And if you’re more comfy in a one-piece–go for it! It’s summer for cryin’ out loud! I don’t need much at the beach. An old beach bag from J. Crew that I purchased around ten years ago is still going strong–and I’m a sucker for Madras! Flip flops from Old Navy…the shade from an umbrella and a towel. Speaking of which, when we were at the beach yesterday, I took my book, 32 Yolks down to the shoreline, sat in my new beach chair, allowed the small waves to hit my legs and feet while reading and a rather random large wave rolled up and broke at my waist, soaking my wig. Took this new beach chair down to the shoreline. I love it because it’s low to the ground! Full of sand in the bottom of my bathing suit, I headed out to the Atlantic to shake the sand out of my bottom when another wave came and almost knocked me over, soaking my wig even more. And an amazing thing occurred. The wig, conditioned with the saltiness and brine of the ocean, dried beautifully. I have to wash the sea out of her but I decided to keep her the way she dried to show you! Here she is today still looking fabulous. I’ll wash her later! For the wig-wearers who read this blog. I ordered another Lacey from Wigoutlet.com. At a total price point of $84, due to the discount, this wig was a great deal. Since she isn’t a lace top, and was purchased at a lesser price, I figured it was a good beach choice. I’m still amazed that she took so much abuse. Lacey, by Envy Wigs is now my beach wig. Roma tomatoes cooked in a bit of olive oil and white wine, a can of black olives, two cloves of minced garlic, red pepper flakes, and fresh basil make the chicken breasts absolutely delicious. Save the olive juice–I add some to the mix! But I wanted a side dish too. And I thought about how much I love risotto. But, it’s somewhat heavy for a summer meal—especially when it’s hot and humid. I had to think. What I came up with was a lighter risotto version that is healthier. I made a mushroom/cauliflower rice risotto. Wegman’s cauliflower rice pre-packaged. Pricier but when you’re lazy–it works fine! An assortment of mushies adds depth! I cooked the mushrooms in a pan with about ½ cup of chicken broth and ¼ cup of white wine. When the mushrooms were cooked down, I added the cauliflower rice and lowered the heat. I stirred the “rice” into the mushrooms until the “rice” absorbed the liquid—about five minutes. I added salt, pepper and herbs de Provence and let it sit. Then before serving I added Parmesan cheese and warmed it up. Low-carb risotto! And boy was it good!!! Turned out so good that Bonaparte, who despises vegetables of any kind, loved it—and he ate quite a bit! I’m having the leftovers tonight!!!! I swear during this time of year, it’s easier to figure out what to wear to the beach than to the office. Summer dressing is a challenge because there aren’t as many options or mixing and matching layers. I still love one-stop dressing of just throwing a dress on, sandals and heading into work. Although this week I ended up wearing pants two days because I was too stinking lazy to bend down and shave my legs. I haven’t been doing this for a while so let’s take a look at what I wore this week. Shall we? On Monday, I did opt for a bright orange dress and with the office A/C I wore a scarf that matched very nicely! Tuesday’s weather was unseasonably cool. I went with a skirt, a tee and a denim jacket. I also wore my new Jord wooden watch which I’ll be writing about later this week! Wednesday brought forth another cooler day and a surprise doctor’s visit–had I known in advance, I wouldn’t have worn this heavier weight skirt that I had to get on the scale with!!!!!!! Thursday. No Shave-a-the-legs so I wore the new pants from J. Crew factory. I loved these skinny cargo pants so much I ordered another pair. I stuck to the neutrals!! Here’s a bit of the beach from me to you! And if you’re interested in some summer reading…another Idea List from my Amazon store–GREAT SUMMER READS LIST. I’m currently reading Sharp Objects, a thriller by Gillian Flynn. I will sit down and read it this afternoon even though I’m not at the beach!!! That F*****g Scale—I’ll Wear That Bikini Anyway—and a Desperate Attempt to Eat Healthier! 2 of the BEST Summer ice lolly recipes EVER! Come rain or shine every summer holiday season needs an ice lolly or two! We bring you two of our favourite summer time treats, Coconut & Mango Tropical Ice Lollies plus Creamy Raspberry Ice Lollies. Both recipes are so much tastier than ice lollies from the supermarket! We just love them and so do our little ones, the best thing is they’re full of fruit with no hidden nasties so they’re healthy too, although you wouldn’t think so when you try them as they taste every bit as creamy and delicious as the decadent varieties. They are absolutely perfect for a summer time treat or any time you feel a sweet craving coming along. We used ice pop moulds which come in a fantastic selection of bright colours. These ice pops are made from flexible, food grade silicone and come with lids making the freezing process extremely easy as you can lie them on their sides if you’re struggling for space in the freezer. They’re especially brilliant for young children as the drips are all caught inside the ice lolly mould, less stickiness on hands, t-shirts and the floor is always a bonus! These ice pops are so easy to make that even the children will enjoy getting involved. All that’s left to do now is grab a blender and let the Coconut & Mango & Creamy Raspberry ice lolly creations begin! Prep Time; 10 Minutes + 5/6 hours freezing. Pour or spoon into the silcion moulds. Leave a 10-15mm gap at the top of the moulds to allow lid to be fitted securely. Place the lids onto the moulds and place in the freezer for a minimum of 5/6 hours or until firm to touch. Not too keen on coconut?! 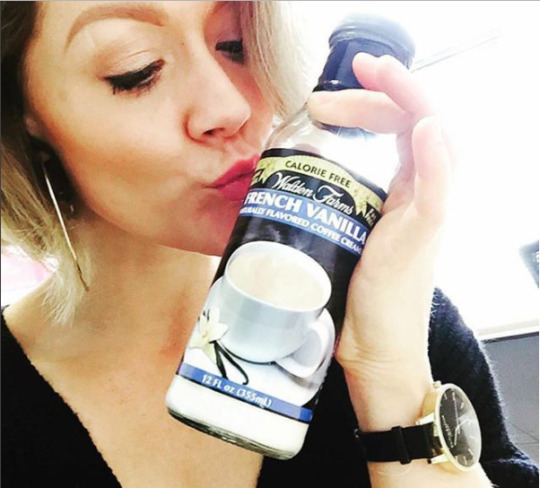 No problem, substitute the coconut milk with Greek yoghurt to create a creamy, coconut free alternative. Prep Time; 10 Minutes + 4 hours freezing. Place a sieve over a large bowl and pour the creamy mixture into the sieve. Using a spatula ease the mixture through the sieve. This process will remove any small raspberry seeds from the mixture to create a smoother finish. You can leave them in if you prefer however the texture will be more grainy. Disgard the raspberry seeds. Pour or spoon the smooth mixture into the silicon moulds leaving a 10-15mm gap at the top. Pop on the lids, place in the freezer and freeze for a minimum of 4 hours. Try replacing the raspberries with strawberries to make a delicious creamy strawberry ice pop, again follow the instructions to remove the strawberry seeds for a smooth consistency. You can create this recipe using frozen raspberries too. Ice lollies will keep in the freezer for up to a month. Happy Ice Lolly Making Everyone! Peel and dice the onion, parsnip, carrot and apples. Put a little margarine in a large pan with a tablespoon of olive oil on a medium heat. When the mixture is hot add the onion, stir until the onion is translucent then add the apples, carrots and parsnips. Sprinkle with a little sea salt and a black pepper. Turn the heat to a low heat. Boil water and pour on the vegetable stock cubes in a heat proof jug. Stir until the cubes are dissolved. Add to the pan and simmer on a low heat for fifty minutes. Blend until smooth with a hand blender. More work to share is on Arthur and Oscar , a site about today’s hot topic writers. Food had a significant part to play in their work! Ma újult erővel vagyok itt veletek. Sokat ötleteltünk, mivel is lepjünk meg titeket a sok “száraz” írásom mellett. Mit szólnátok ha ezek után rendszeresen jelentkeznék ínycsiklandó és 100%-ban egészséges receptekkel, amiket ti magatok is egyszerűen el tudtok készíteni otthon, minden bonyodalom és komolyabb főzési tudomány nélkül? Vágjunk is bele! Ma kezdésnek kettő receptet is kaptok tőlem, csak hogy biztosan szuperül induljon a napotok! Kezdjük a reggel egyik elhagyhatatlan kellékével, a KÁVÉVAL! Keverjük össze míg habos nem lesz és élvezzük minden cseppjét! Együnk mellé egy finom saját készítésű protein szeletet. Mutatom hogyan csináljátok. Egy kevés vízzel egyenletesen keverjük össze a hozzávalókat. Tegyük egy tepsibe, és hűtőszekrényben 30 percig állni hagyjuk. Ebből a receptből 16 darab protein szelet jön ki. Próbáljátok ki! Nem fogtok csalódni. This tuna cake recipe works great for anyone following Ideal Protein Phase 1 or another low carb diet. There is no breadcrumbs or other filler in the cakes. That being said, these tuna cakes are very delicate! There is not much holding them together. So, handle them very carefully while cooking them! I did find that freezing them for about an hour before cooking did help to keep them together. You can serve the tuna cakes with whatever vegetable floats your boat. Brussels sprouts, asparagus, or rainbow salad would be great sides. However, this time around, I went for the rutabaga fries and broccoli. In a large bowl mix together tuna, eggs, garlic, parsley, ginger, red pepper flakes, salt, and pepper. Form 6 equal sized patties. Place the patties on a platter and place in the freezer for 60 minutes. After 60 minutes, heat olive oil in a cast iron skillet (or any other heavy pan) over medium-high heat. Remove tuna cakes from freezer and add to the pre-heated pan. Cook the tuna cakes for 3-4 minutes on each side. When flipping them be very careful as they may fall apart. Nutrition: Calories 269, Protein 36g, Carbohydrate 3g, Dietary Fiber 1g, Total Sugars 0g, Total Fat 12.5g. I mentioned these Tuna Cakes on my Rutabaga Fries post and I figured I would share the recipe. It’s always fun to put a healthy spin on comfort food and sometimes there’s nothing more comforting than Chinese takeout! 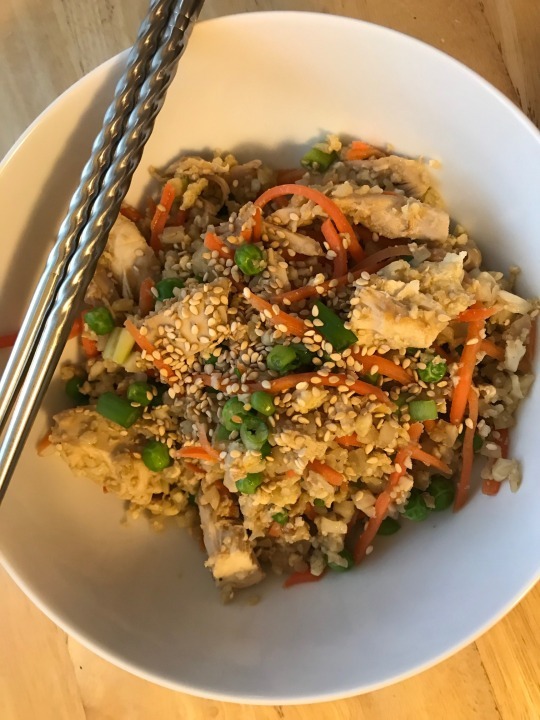 I love spiralizing veggies, but hadn’t tried ricing them yet, so I decided to experiment with cauliflower “rice” by transforming it into chicken fried “rice”! It ended up coming together super quickly, tasted great as leftovers and most of the ingredients were things I regularly have on hand. The only thing I splurged on was buying sesame oil because I thought it’d add some more depth of flavor (I was right). now that you’re done with the collecting, let’s move onto the doing! 1. Put 1 T sesame oil into a wok or large pan, over medium high heat and add the riced cauliflower. Add garlic and ginger and stir until mixed and warmed, appx. 2-3 minutes. 2. Form a well in the center of the pan and add remaining sesame oil to the center. Crack the eggs into the well and stir to scramble. 3. Once scrambled, toss with cauliflower rice and add chicken, shredded carrots, peas and scallions. 4. 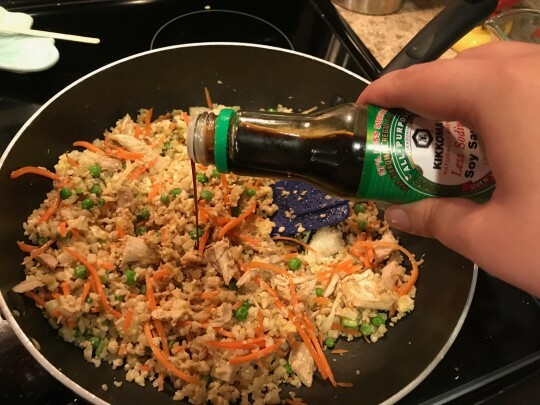 Stir everything together to mix and drizzle soy sauce over entire pan. Let cook together for another 2 minutes or so and then portion out into bowls. 5. Top with scallions and sesame seeds and enjoy! When you’re watching your weight or lead a busy lifestyle, meal prep is your best friend. You’ll be able to stick to a enjoyable lifestyle and won’t have to think about preparing a new healthy meal three times a day. Trust us, it’s worth it. This is our basic guide to meal prep if you’re just starting out or want some new handy tricks to firm up the process! Invest in some containers, they are essential to meal prep. We’d recommend some plastic tupperware that are similar sizes. They’ll fit perfectly into your fridge and you won’t be stuck trying to do fridge jenga! You can also use mason jars or other glass containers. Make sure whatever you use is microwave friendly so you can heat prepped meals up. This is the golden ticket to meal prep. Plan well and the rest of the week will be a breeze. Look at your calendar and work out how many meals you’ll need to prep, and what meals they are. Don’t forget about snacks too – be true to yourself and admit that you’ll be hungrier than perhaps you’d like to be. If you try and be ‘good’, by skipping snacks or even meals, you’ll most likely go off track with your meal prep altogether. 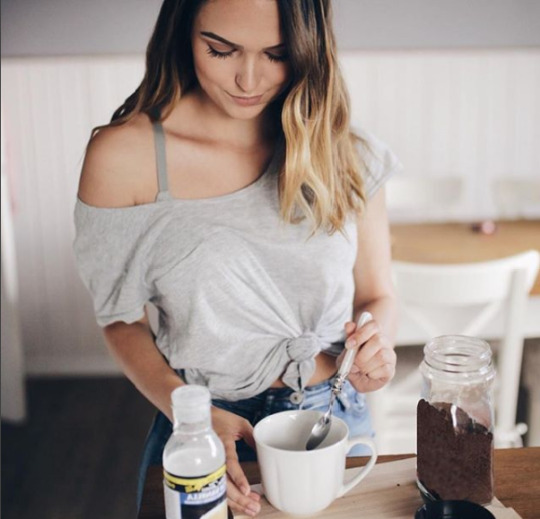 If it’s your first time prepping, consider adding more super healthy snacks to your plan so that you don’t feel guilty but you can gradually learn exactly what you need throughout the week. When making your weekly menu, think about staple foods and a balanced diet. What’s the point of meal prep if its not nutritious? Make sure you have enough carbs, protein, fruit and veg in your meals. Staple items include chicken, rice, pasta, fish etc. Also when making your menu, remember to include food that is yummy. If you’re bored of your meal plan by Wednesday, it’s probably because you’re not looking forward to your next meal – i.e. you haven’t planned exciting, delicious meals! With your menu in hand, hit the supermarket. Make sure you buy according to your list – this way you’ll stick to your plan by not being distracted by the sugary snack you gave into when in the chocolate aisle! A popular time to prep is a Sunday evening. It’s usually ‘free time’ in your weekly schedule and will shake those Sunday blues while getting you pumped for the week ahead. 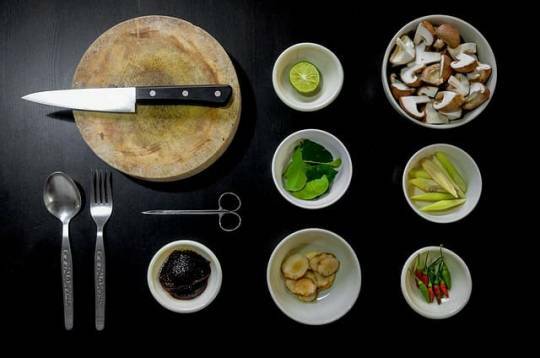 Set aside a 2-3 hours depending on how many meals you’re prepping for. Also think about how much time you’ll have to spend cooking during your busy week. If you’ve got time to spend on cooking, chop up your veg and portion meals then leave them in the fridge so you can cook them fresh! Here’s the fun bit! It’s a good idea to bulk cook foods like pasta, rice and quinoa. They’ll last all week but also take the most time to prepare. Cooking in large batches will save you so much time. All you’ll have to do later on is reheat and serve – simple! You can also cook protein like chicken or boiled eggs which can be reheated or eaten cold. Veg can also be pre-cooked, but it’s much nicer freshly cooked – check your list about what time you have during the week to figure out if you should pre-cook your veg or not. Next, put everything in portions so that you have each meal in a separate container. Then portion all your snacks and you’re all set!